Due to the different sizes and weights of the popcorn, please call to place your order at 319-622-7640. Ask for Victoria-Thank you! At Amana Colonies Popcorn & Ice Cream Company we take great pride in making our gourmet popcorn.We use only the finest ingredients to ensure you enjoy the best gourmet popcorn experience. We use only real cheese and make our caramel from scratch using our family recipe. offer over 60 delicious flavors of gourmet popcorn that can satisfy anyone with just a few bites. Quality is what we dedicate ourselves to in every batch, made fresh daily in small batches, under watchful eyes, to ensure you enjoy the finest quality gourmet popcorn. We will never deviate from our goal of creating the finest, most delicious gourmet popcorn available anywhere. We're sure you'll agree...Amana Colonies Popcorn & Ice Cream Company's famous gourmet popcorn is perfect for corporate gifts that your clients will appreciate forever. These corporate gifts are also wonderful for employee appreciation gifts, as well as a gesture for any special occasion. 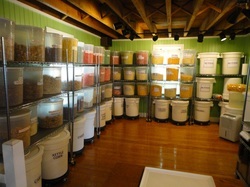 Amana Colonies Popcorn & Ice Cream Company offers unique corporate gifts that are sure to please and leave a favorable, lasting impression.